Sanzhar Dzhafarovich Asfendiyarov was born on October 20, 1889 in Tashkent. At 1907 S.Zh.Asfendiyarov graduated Tashkent real school, during 1907 – 1912 years he studied for St Petersburg military medical academy. During the First World War he worked as military doctor. During 1919 – 1925 years S.Zh.Asfendiyarov worked at general positions: 1) 1919-1920 years – the national commissioner of Health care of Turkestan Autonomous Soviet Socialist Republic; 2) 1921 – 1922 years – national commissioner of Agricultural sphere of Turkestan Autonomous Soviet Socialist Republic; 3) 1923-1924 years – the national commissioner of Health care of Turkestan Autonomous Soviet Socialist Republic. During the 1927 – 1928 years S.Zh.Asfendiyarov was the Director of institute of Oriental studies named after N. N. Narymanov (Moscow), at this time was elected as professor of Moscow State University. 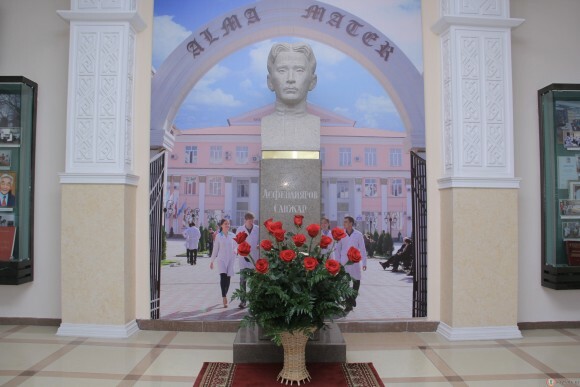 Sanzhar Dzhafarovich Asfendiyarov also known as the first rector of Almaty Medical Institute (1931-1933) for present day Kazakh National Medical University named after S.Zh.Asfendiyarov. Being the rector he opened the next departments: General chemistry, Biology, Physics, Anatomy, Physiology of internal diseases, Histology, Microbiology, Pharmacology, Biological chemistry, Hygiene and Department of surgery. S.Zh.Asfendiyarov did a lot of work for prevention of infectious diseases, on the rendering free medical care to the population of the republic. And also organized activity for fight with the extended diseases among the population as tuberculosis, smallpox, plague, skin diseases. Sanzhar Asfendiyarov was fluent in Russian, English, French, Latin languages and languages of East nations. At 1937 he was arrested in Moscow and then moved to Almaty where he was in prison in a temporary insulator. On 25 of February 1938 he was ordered to shoouting. According to the decision of the Supreme Court of the USSR of May 26, 1958 S. Zh. Asfendiyarov was rehabilitated. In compliance with the Resolution of Council of ministers of KAZSSR by January 11, 1989 Almaty Medical Institute was named after S. D. Asfendiyarov. A memorial plaque was established in the house where S.D.Asfendiyarov lived. In 1962 Naberezhnaya St. of the city of Almaty was renamed into S. Asfendiyarov Street.